The U.S. embassy in Tirana, the capital of Albania, has been shamelessly pushing the Soros agenda in the region for some time. Last week, we wrote about embassy leaders openly tweeting their disdain of President Trump, by retweeting tweets of fired and disgraced former FBI head, James Comey. We have written about the State Department’s apparent outsourcing of Balkan diplomacy to Alex Soros, George Soros’s son and new emissary. We have written about the failed justice reform pushed by Soros which has resulted in a nation without a constitutional structure; ie, no constitutional court, and the rampant illegality that is alleged to be happening in the socialist Rama government. You can read about all these issues on the links below. 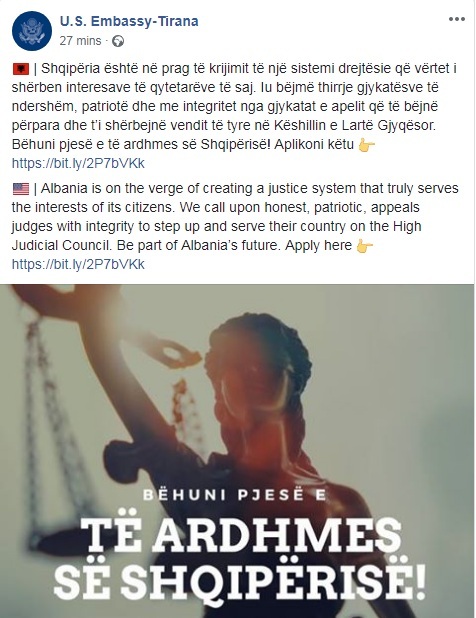 The extent to which the embassy is willing to go to push the failed justice reform and help the Rama government get out of the disastrous ‘reforms’ was clear this week when the embassy posted on its website a call for Albanians to follow illegal behavior. See the post from Facebook below. 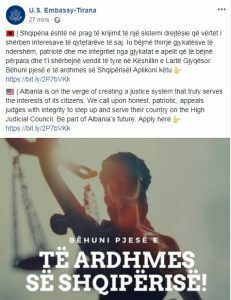 Albania is on the verge of creating a justice system that truly serves the interests of its citizens. We call upon honest, patriotic, appeals judges with integrity to step up and serve their country on the High Judicial Council. A link refers to the website of the High Court with the announcement of the reopening of applications. As Exit explained before, the first vetting of the KLGj candidates failed to produce enough qualifying candidates as no appeals prosecutor from outside Tirana was able to pass the vetting. Subsequently, High Court president Xhezair Zaganjori announced the reopening of applications on the website of the High Court. However, the announcement violates several justice reform laws, as the High Court has no role in the election of the first KLGj. While it appears that Zaganjori has made this illegal move with the approval of the EU Delegation and the EURALIUS mission, the International Monitoring Mission has in fact appealed the confirmation of Zaganjori as High Court judge by the Independent Qualification Commission (KPK). An official appeal against the confirmation of Zaganjori by the Public Commissioner at the Special Appeals Chamber is expected once the KPK has been published. There seems to be a severe leadership problem in the American embassy in Tirana. The Trump administration needs to get its people in there – fast. There is no time to waste as they are acting with impunity.